2019 WEDA Environmental Excellence Awards The Awards will be presented during the WEDA Luncheon on June 5th at the 2019 Dredging Summit & Exposition in Chicago, Illinois, USA. Applications should be submitted in PDF format by April 19, 2019, to Craig Vogt, Chair of WEDA’s Environmental Commission, at Craig@CraigVogt.com. Promote communication and understanding of environmental issues and stimulate new solutions associated with dredging and placement of dredged materials such that dredging projects, including navigation and environmental, are accomplished in an efficient manner while meeting environmental goals. Mitigation or Adaptation to Climate Change: This category includes dredging or marine construction projects that exemplify and implement the WODA Statement on Mitigation and Adaptation to Climate Change. Click HERE to read the WODA Statement. For further explanation of this category, see text boxes below. These awards will be announced and presented during the WEDA Luncheon on June 5, 2019, during the WEDA Dredging Summit and Exposition in Chicago, Illinois, USA. Recognition will include a plaque, a press release, and a special highlight on the WEDA website. The award will be for a project, and team members will be recognized. The preference is for all project team members to be WEDA members; however, at least one of the project team members must be a WEDA member in good standing. The project must be related to dredging or marine engineering, consistent with WEDA’s mission, which includes beneficial use of dredged material. Applications will be accepted only for those projects that have been approved by all applicable regulatory agencies, and implemented. Project applications will not be accepted without necessary permissions from the project owner (if applicable). Projects cannot be resubmitted regardless of whether or not they were awarded the WEDA Environmental Excellence Award, with the exception of the Mitigation and Climate Change Category*. See the text box. Summaries of the Award-winning projects, as written in the applications, will be included in a press release and possibly in a newsletter or other electronic communication. All project applications will be included, as submitted, on the WEDA website, after the June 2019 Chicago Dredging Summit. Submittal of an application grants permission for these actions. Attendance of a project representative at the WEDA June 2019 Chicago Dredging Summit is expected of all award applicants. Posters from all applicants: Please bring a poster (e.g., 24 inches by 36 inches or 50-60 cm by 70-80 cm) to show off the project to attendees at the Chicago Dredging Summit. The intention is to enhance all attendees’ understanding of the projects, the project team, and the project accomplishments. These will be displayed in the foyer leading to the exhibit hall. If you want to keep the poster, please make arrangements to have it return home with you. While projects will be awarded based upon their merits, using the ranking criteria provided below, the WEDA Environmental Excellence Awards Review Team does appreciate an application that is well-formatted, easy to read, and explains how the project qualifies based on each ranking criteria. 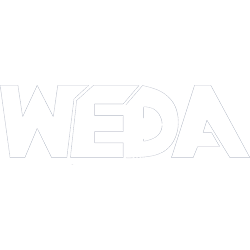 The WEDA Environmental Excellence Awards Review Team are each a member of WEDA’s Environmental Commission. What unique environmental challenges were addressed? Were any mitigation measures adopted? If so, list out the measures. Did the project incorporate the principles within the approaches of working with nature or engineering with nature? How does this project show leadership and take steps beyond “traditional” environmental protection efforts? Did the project “break new ground” in addressing the environmental challenges? What methods, technologies, or approaches (including partnerships) were used? What sustainable approaches were applied? Explain implementation of cost-effective methods, procedures, or practices in terms of environmental protection efforts. Were there project efficiencies? Were there any specific cost-saving or economic enhancement components of the project? What are the socio-economic aspects of the project, e.g., positive impacts to the quality of life to stakeholders? How does the project contribute to the economy? Are the project characteristics and lessons learned transferable and can they be used by others addressing similar environmental issues? What education and/or outreach activities were undertaken? What mechanisms were used to involve the broad array of stakeholders? 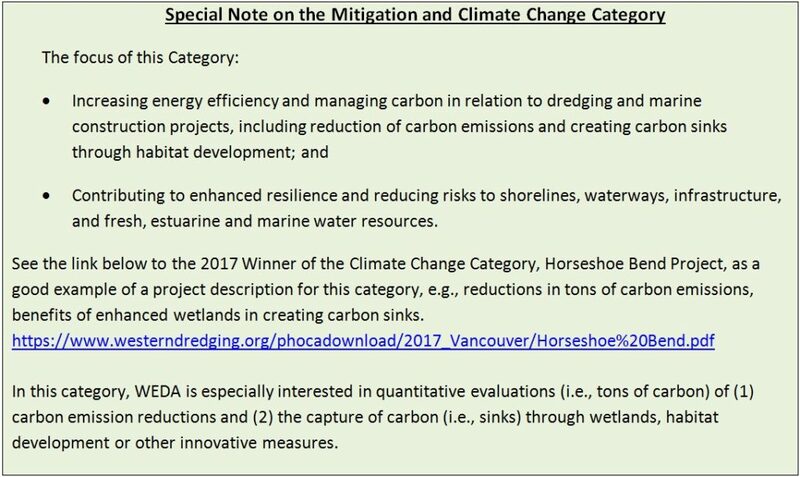 Applications should clearly identify the award category: Navigation Dredging, Environmental Dredging, or Mitigation and Adaptation to Climate Change. Important: Applications are to be no longer than 6 pages total length. Cover page. Does not count towards page count. Summary: project description: goals, objectives, accomplishments (one page maximum). The Summary will be used in the press release. List of project team members and their affiliations, including the project owner, the role of the team members, WEDA membership status, and the nominating entity. Inclusion of project figures, diagrams, or photographs is encouraged (maximum of three pages). These pages do not count towards the page count. All applications should be submitted by April 19, 2019, in PDF format to Craig Vogt, Chair of WEDA’s Environmental Commission, at Craig@CraigVogt.com.